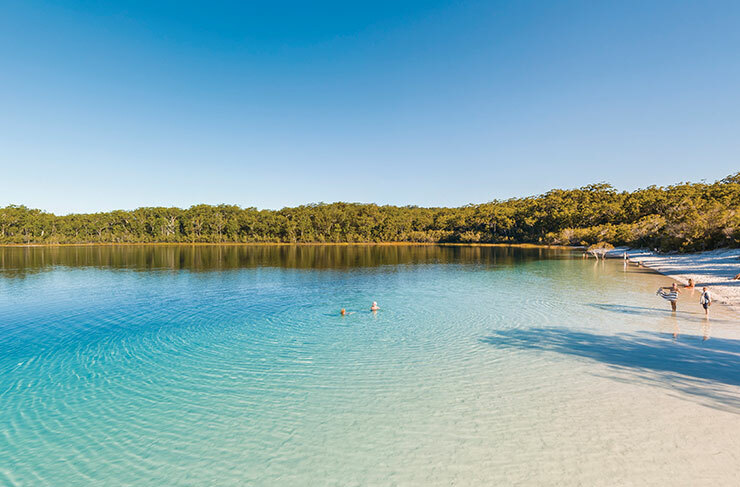 Fun fact: Fraser Island is the world’s biggest sand island. Sand is its major export. If the world ever runs out of sand, you know where to find it: just hang a right past Noosa and keep going till you hit paradise. 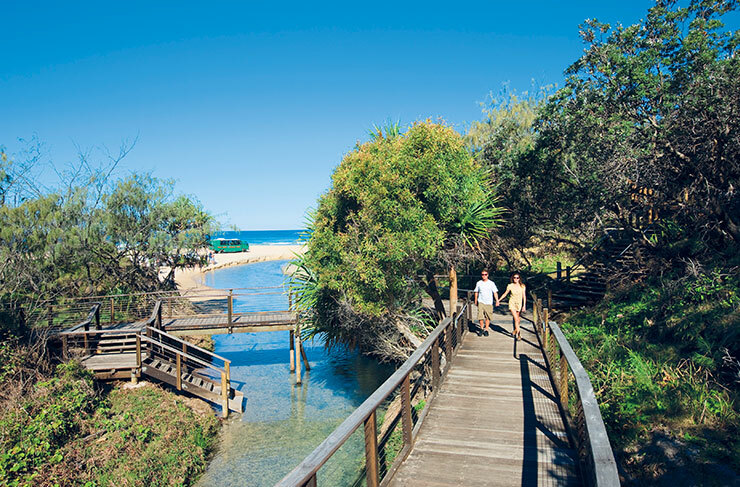 When colonists first discovered Fraser Island, they immediately recognised its cultural and ecological importance. Nah just kidding, unfortunately they logged it for about 100 years. Thankfully all that stopped, and the island is officially protected as part of the Great Sandy National Park (Australians are great at naming things). 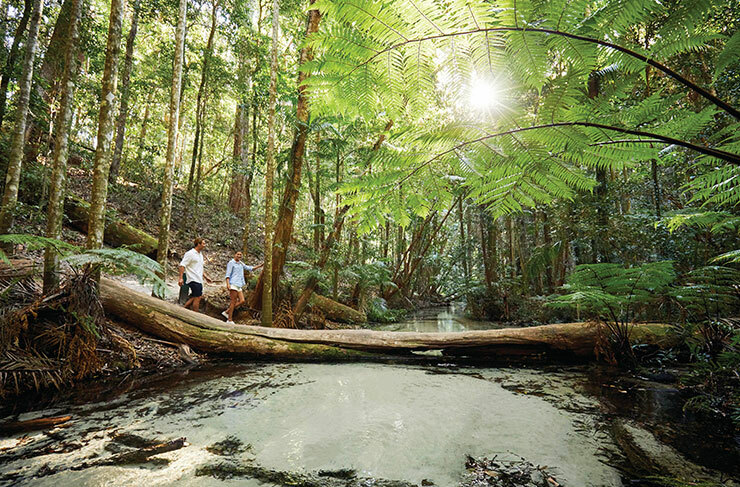 These days Fraser Island is Queensland’s eco-tourism destination: a tangle of rainforests, eucalypt woodlands and mangroves, surrounded by long, flat beach highways. Here’s how to do it right. “So it’s like a lake, on an island?” Yeah, we were told—except it’s not what you think. This turned out to be accurate. Usually lakes are inky black, very cold and full of eels. But Lake Mackenzie is more like an inland sea. Think sugar-white sands, aquamarine water and warm shallows where you can paddle for hours. Technically this is a “perch” lake, which means it’s fed entirely by rainwater (no springs, no rivers, no connection to the outside world). On a calm day, the surface is like a mirror, reflecting the distant forest and the sky above. Pro tip: rub the sand all over your face and body. It’s pure silica, and apparently one of the best natural exfoliates you can get. When we pulled up at Eli Creek, there were already several 4WDs parked out front. People were setting up tents, grilling snags on small portable BBQs and settling in for a typical Queensland afternoon. The reason they’re all here? Eli Creek. It’s the largest creek on the eastern beach, pouring up to 4 million litres of crystal clear fresh water into the ocean every hour. 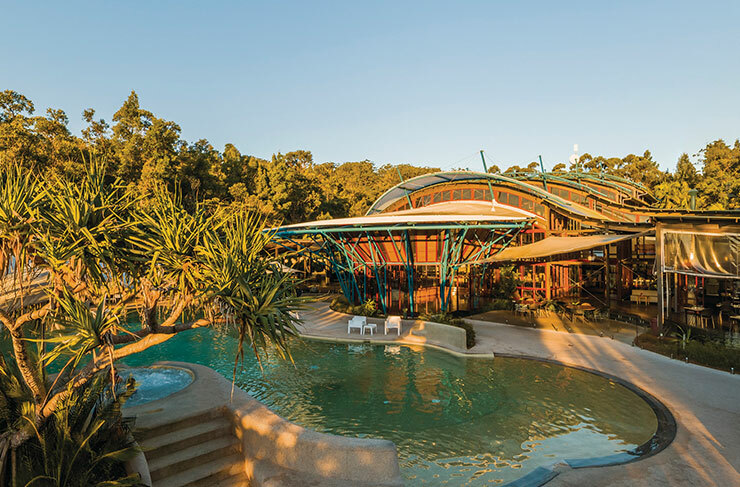 Here’s how to do it: head up the change rooms at the top of the hill, change into your togs, then follow the boardwalk into the bush. Eventually it stops at the creek, and you can float all the way back to the beach, carried along on gentle currents, drifting past banksia and pandanus palms (and a few crying toddlers). Eli Creek gets busy, so visit in a shoulder season if you want to avoid the crowds. Here’s some trivia for your next pub quiz: there are only two beaches in the entire world that operate as commercial airports. One is on Fraser Island (the other is way up on the north coast of Scotland somewhere, so who cares about that one). The beach pilots of Air Fraser Island look like something out of Top Gun: knee-high white socks, aviators, slicked back hair and airman's lapels. They’re kind of badass. 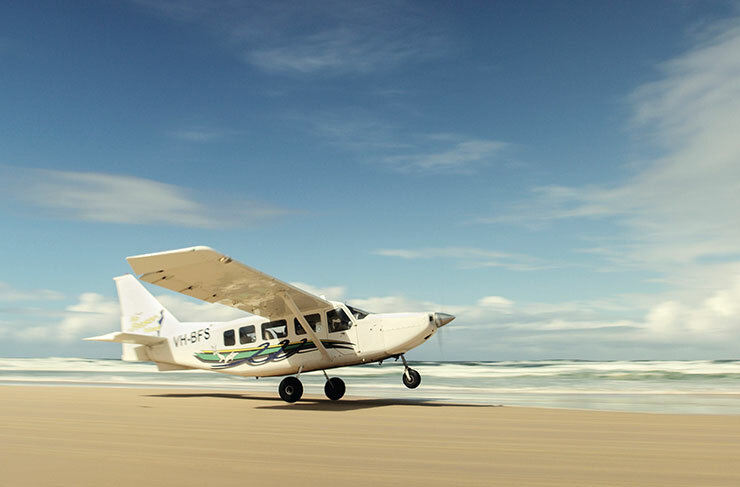 You can do joy flights with these guys from the eastern beach: the plane taxis then roars along the sand, then you’re climbing above the breakers, spotting whales out the right-hand window, looking down at the famous sand blows, blanketing huge swathes of coastal forest. Our favourite bit? When our pilot decided to show us what “negative g-force” feels like...yeah that was super fun and not teeth-clenchingly terrifying in any way. The Maheno shipwreck doesn’t come with cautionary tales of ghost sailors stalking the dunes. There’s nothing about the moon striking the ship at a certain angle on a certain day. 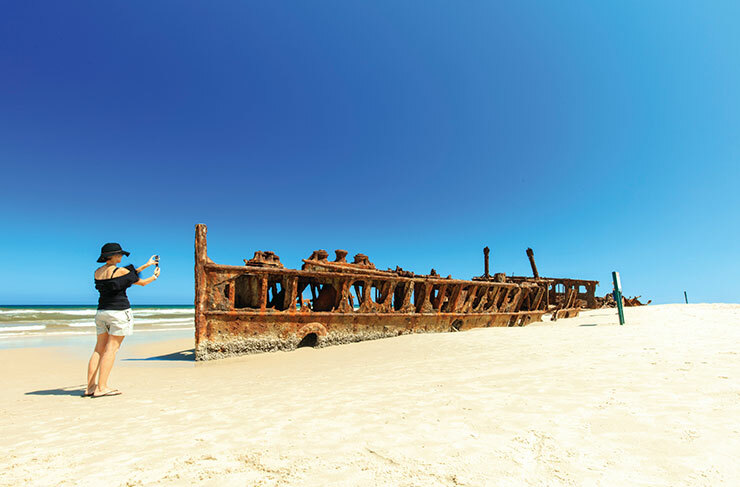 It’s just a big rusting hulk, washed up on Fraser Island’s eastern beach, but it’s still pretty cool. It’s also probably one of the world’s more accessible wrecks: you can literally park the car and wander over. It’s sitting right on the tide line. Maheno ended up here in 1935, blown onto Fraser by a passing cyclone. You get a great view from the air (see Air Fraser Island, above). Keep an eye peeled for migrating humpback whales in the ocean too—they pass right by here between August and November. Might sound weird to get excited about a tree, but Fraser Island is home to one of the world’s biggest populations of satinay. These guys grow to 40 metres high, 1000 years old, and ten of your mates would struggle to join hands around the trunk. Probably the closest thing Australian native fauna has to the giant California Redwoods. A lot of the satinays on the island unfortunately got logged in the 1800s, but there’s still a few pockets on the high dunes that never saw an axe. Interesting fact (well, interesting to us) many of Fraser island’s Satinay’s were sent to Egypt to help build the Seuz Canal. When you’re driving through the forest, keep an eye out for picnic sites and walking trails—there’s a bunch crisscrossing the island. Let’s be honest, your options are limited on the island. Since so much of it is protected national park, building swanky new mega-resorts is kind of frowned upon. Kingfisher is easily the nicest place to stay on Fraser, and probably gets 90% of the island’s juicy tourism dollars. While you're in the area, don't miss out on Rainbow Beach. It's the bit of the Great Sandy Park no-one talks about (but they really should).